Hensley’s study breaks down into three larger Parts. The evidence for the editing of the Hebrew Psalter is capably rehearsed in the three chapters. Hensley’s most unique contributions come in Parts 2 and 3. Part 3 provides a thorough examination of significant covenant passages, namely Psalms 72:17, 86:15, 103:8, 145:8 and Psalm 1-2. Each passage is considered in its Psalm and wider Psalter contexts. Psalm 72:17 in chapter 9 identifies the royal Son of David as the means through which the Abrahamic covenant will be fulfilled. Chapter ten identifies that clear allusions to the “grace formula” (Ex 34:6) are found in Psalms 86:15, 103:8 and 145:8, and so they are considered in turn. Hensley asks whether this phenomenon may indicate that the Psalter’s compiler(s) are “crediting the traditionally Mosaic role of covenant mediator and intercession to the (awaited) Davidic king” (p. 209). Chapter eleven discovers that “David” in Psalm 86:15 is “not an individual begging for forgiveness on his own behalf” (p. 221), but acting like Moses as an intercessor. Chapter twelve argues that, as “Pss 101-104 present a coming king through whom YHWH would realize the vision of Pss 93-100” (p. 237), Psalm 103:8 proclaims YHWH’s compassionate character towards his exilic people. Chapter thirteen finds “David” in “the leading role in declaring YHWH’s grace and compassion and the fulfillment of his covenant promises” (p. 253). Chapter fourteen considers Psalms 1-2 as the introduction to the Psalter, concluding with the rest of the study that these psalms indicate that the editors intended to “‘royalize’ the Mosaic covenant rather than ‘democratize’ the Davidic” (p. 261). This point stands in contrast with the views of many contemporary Psalms scholars. In fact, this is one of the more striking contributions of Hensley’s argumentation. I am appreciative of the canonical approach to the Psalms, but—and I find this to be true with much of this approach—I am wary that what appears to be argumentation is in fact sometimes simply observation, associations, or statistics. Some of Hensley’s argumentation goes something like this: many of the psalms’ allusions to the Torah are found within Davidic psalms, therefore David is presented as an ideal and representative Torah-keeper. While this may be a correct inference from these associations, other explanations may be offered. Perhaps one should expect most occurrences of Torah to be in the Davidic psalms, given that most of the Psalms are in fact Davidic! For example, could this fact be an expected “accident,” or must it reflect something more; something of the intention of the Psalter’s editors? Some of contemporary Psalms scholarship works from citing statistics and associations and then drawing conclusions that may not resonate with a close reading of the individual passages. However, this is not the case for the majority of Hensley’s points. His case is well argued and compelling. Hensley’s study concludes that the Psalter’s editor(s) “seem to have anticipated an ideal future Davidide who, being faithful and observing Torah, identifies with frail, dust-like humanity and intercedes for them” (p. 217). Amen! I can only appreciate Psalms scholarship that bolsters and nuances a messianic reading of the Psalter. 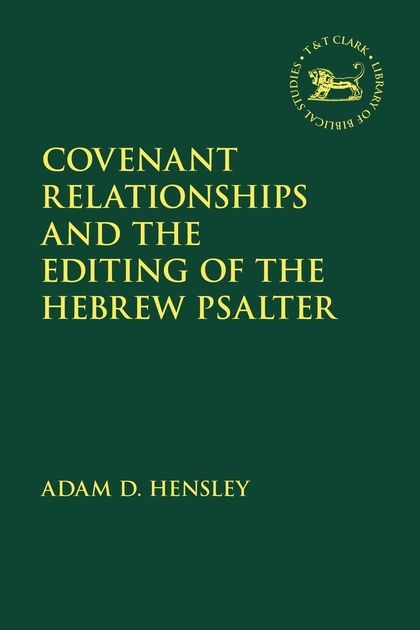 Covenant Relationships and the Editing of the Hebrew Psalter is a solid contribution to Psalms scholarship and goes some way to explain how the NT authors and beyond could find Jesus so readily in the Psalms. As a high academic work, this is recommended to scholars and serious students of the Psalms. Many thanks to Bloomsbury Publishing for providing a copy in exchange for review.